I just attended a Collaboration conference where the wireless network was so overloaded, if you managed to actually connect, it was slower than dial-up. I never felt so disconnected (the irony). I decided to try out “tethering” for the 1st time, where I can use my cellphone to connect my laptop to the internet. WinMo 6.1 has an icon for “internet Sharing” right on the apps page, so i figured it should be easy. I want to use the connection over Bluetooth, so before I do that I need to connect my phone and laptop. Relatively straightforward process: Set Bluetooth on phone to broadcast, go to laptop and search to add a new device, select phone to add, enter generated passkey on cell and you are done. Now we should be able to connect right? 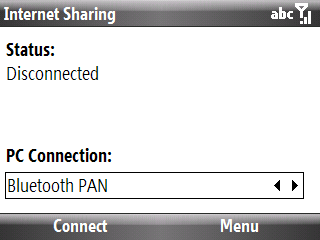 From the Start page, select Internet Sharing, and select Bluetooth PAN (personal area network) as the connection to use. Ok, hit Connect, and it looks like I’m connected! 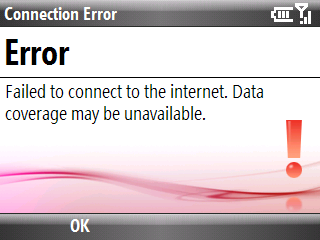 Except, a few seconds later I get the dreaded “Error”. It appears I need to modify my data connection configuration. You will also notice that there is a lock icon beside each one indicating that they are ‘read-only’. Thanks to Mike Temporale’s article, there is a way to remove this lock without hacking the registry. Open the File Explorer (found under Start \ All Programs \ Applications \ File Explorer) and browse to the Windows folder. Once in the Windows folder you are looking for an application called “UAMgr”. The quickest way to get to this file is to push the letter U on the keyboard and the phone will jump down to the files that start with U. Run UAMgr by highlighting the file and pressing down on the action button. When the application opens you will see a screen that says “User-Agent Manager″ in the center of the screen. Press the Menu \ Tool \ Unlock ReadOnly. The phone will then present you with a confirmation screen indicating that Read Only has been unlocked. Press OK and then Close and you’re done. 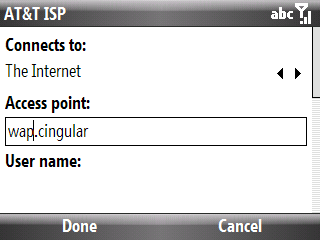 Now that the locks have been removed, edit the connection for “AT&T ISP” and chance the access point to ‘”wap.cingular”. Now try and Internet Sharing again, and the connection should hold. Once this is done we have to setup our internet connection on the laptop. 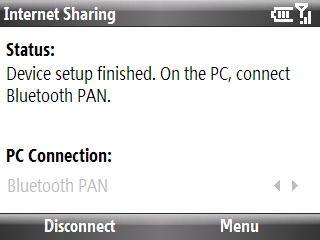 Select ‘Connect to a Bluetooth personal area network (PAN) and click Next. The next window should display your phone icon. R-Click your phone icon and select ‘Connect using –> Access point. 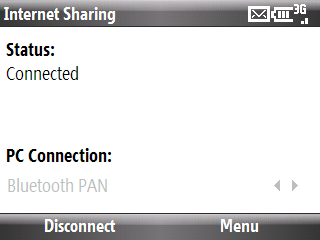 A Bluetooth Network Dialog should pop-up with a ‘Connection successful’ message. Now you should be successfully connected to the internet! After a thoroughly exhilarating and exhausting week at SPC 2009, I started my first day in the offices at Jornata HQ. Having being skeptical about leaving a stable job to join Mauro and Scott in such turbulent times, I can only say I absolutely made the right decision. Never before have I experienced such enthusiasm for not only SharePoint, but technology in general as I did this morning. This accompanied with equal enthusiasm for delivering excellence makes for a successful recipe.